Cornwall MPs have renewed their attempt to make the date of their patron saint a public holiday in the county. The county's five MPs have signed a Commons motions asking for the government to officially mark St Piran's Day, which falls on 5 March. Staff at Bodmin, St Columb and Penzance councils have already been given the day off. This year, celebrations will focus on marking the Cornish language, recently declared dead by the United Nations. This is not the first time Cornwall's MPs, all Liberal Democrat, have officially called for the day to be a bank holiday, but so far the government has not agreed to their request. Their current early day motion states: "This house notes that celebrations in honour of St Piran each year are growing in scope, support and significance. "This is a valuable opportunity for the people of Cornwall to celebrate their unique heritage, language, culture and aspirations." Cornish language campaigners have been invited into a St Austell supermarket to make tannoy announcements in Cornish and teach phrases to shoppers. 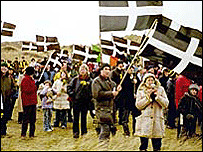 Organiser Jan Halstead said: "This will be my sixth St Piran's Day event and this year is even more special as it will show the EU how wrong they really are to declare the Cornish dialect extinct! St Piran is said to have come ashore at Perranporth, in Cornwall, in the 6th Century, having journeyed in a currach, a small boat, from Ireland. He is the patron saint of tin mining, once a booming industry in the county.